Sept 12 passed by in a blur. Last minute packing, medicine/grocery shopping, putting together laundry lists, delegating pending items (Ave Q tickets, ART tickets), buying travel guides, printing e-tickets, getting passports... hmmm.. as you can imagine, we did so many things at the last minute. We arrived at the airport almost an hour before take-off and everything just fell into place. We were able to get a travel tax discount for Andre. 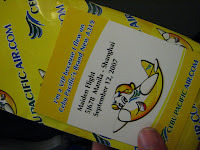 Our flight just happened to be the maiden flight of Cebu Pacific to Shanghai so we had free dinner c/o Superbowl and giveaways. We also won the in-flight game (yes, there are in-flight games on Cebu Pac foreign legs). 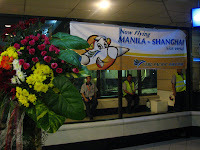 As we stepped out of the airline doors, we were greeted by the faint smell of dumplings and a super efficient immigration system. After clearing customs and hopping into a taxi, we sped off into the night on a freeway that could give the Autobahn a run for its money. We zipped past rows and rows of neatly arranged apartment complexes (their version of the Pabahay sa Riles) shielded by nicely tiled walls. As we got closer to the city, we got on an "elevated road" which we soon nicknamed the Mother of All Overpasses. After about 20 minutes travelling along this overpass at top speed, we descended to street level and turned into our homebase for the next 5 days -- Merry Apartments.